Want to book the Sisters? 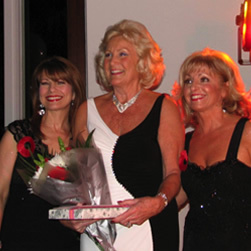 Sisters in Song have a lifetime of experience helping people mark their special occasions; from christenings; weddings; milestone birthdays; weddings; bar mitzvahs; anniversaries and sending off parties (yes even funerals!) the sisters will personalise your event with a rare mixture of sensitivity, humour and professionalism.....you're guaranteed a night to remember! The sisters herald from a large family themselves; they understand the dynamics of family life and how to get all ages to let their hair down. Sisters in Song musical repertoire stretches from 1918 right through to 2000s offering something for everyone....granny and grandsons alike will be talking about 'that' party in years to come. The sisters want to be involved in all aspects of the planning of your event; timings, song choices and dedications....you name it and they'll do everything to deliver your dream party! Is there a favourite song; speeches or family anecdotes to retell throughout the night? Call today on 07812 151548 for an informal chat...your wish is their desire! "You won’t be disappointed with the music or banter of Sisters in Song!" "The Sisters gave another entertaining night of music and song to suit all tastes, plus the right balance of humour and audience interaction; truly professional"
"If you want the best party ever, book these gorgeous girls now!" "They are ideal for audiences of mixed age groups and combine wit and humour with their fautless singing talents."